I am a full-time professional photographer and I'm very impressed with Affinity Photo for iPad. I believe it could allow myself and other photojournalists, who are often traveling with a lot of gear and transmitting images from the field, to lighten our loads and simplify our editing workflow. However, I need to be able to edit/append photo metadata without having to send the photos back over to my laptop. Specifically, I need to include caption/description, copyright status, location data, and creator/contact info with the files I submit. Currently, there is only one iPad app I know that can do this (Photogene) but it is set to become obsolete as soon as iOS11 is released. I'd love to help develop this app for photojournalists, I think it would be a great tool for many of us. I genuinely think Photogene was ahead of it's time on iOS and still outdoes many apps out there. I know I would love to see the file management and export options replicated in Affinity Photo. I would love to see this feature for my ipad as well. 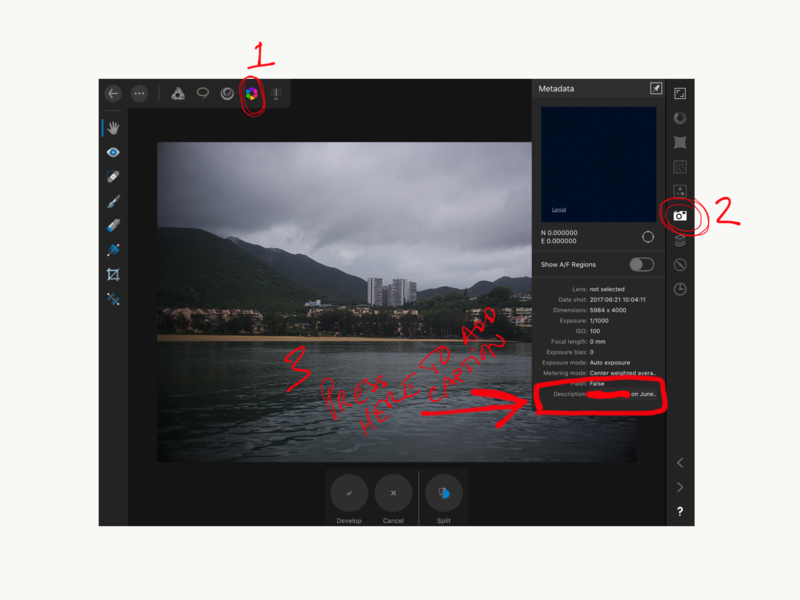 I'm a staff photographer for a wire agency and am trying to use my ipad instead of laptop for similar reasons as newbie. Photogene⁴ is a great app, as is Filterstorm - although not working for me right now - but it would be very handy not to have to switch between apps when sending pix. Being able to import IPTC templates from any given photo would be really good, as well as having a list of iptc templates that can easily be applied to photos. FTP ability as well please! A lot to ask probably, but you'll definitely see a huge increase in photojournalist customers if you create these features. I too would appreciate editing capabilities of at least the most important EXIF/IPTC data. But that seems to be quite a challenge since it took even Adobe ages to integrate basic meta data editing into Lightroom for iPhone. Still no signs from them of bringing that on the iPad. Even Apple's own Photos app does not allow you to change the photo description on an iOS device, let alone other parameters. Seems they do not really get what's important to pros nowadays. It would be nice to have the AP programmer's view on that topic. Maybe such a feature is not important enough from an economic standpoint for the time being? Have just seen that you are able to add a caption into photos. It still doesn't add the name of author though - and doesn't appear carry that info over from my camera copyright. But at least it's a very basic start at embedding a caption. Have included a screen grab here. Please Affinity, add IPTC and FTP features! I'm sure that all of us on this forum subject would be up for helping test a beta update with these functions. Full IPTC support is the only way this software can hope to stand as a viable Photoshop alternative. For desktop applications, there is a workaround if you use Photo Mechanic to caption and transmit. But for the iPad/iPhone, there's a real vacuum that a smart company like Affinity could readily fill. Captioning a photo is essential for sending a picture out from remote locations using a phone or tablet when a laptop is impractical. There are lots of photographers out there working for publications that would readily drop their Adobe subscriptions if they could. It's hard enough securing adequate pricing for work, having to pay a monthly fee for something that we could previously purchase outright just adds another hassle to this business. I miss the IPTC Support too. If you work for agencies like DPA, Springer etc. full IPTC Support and Batch Support is essential. If you need more info look at www.iptc.org. I find it hard to believe that I cannot edit EXIF data in Affinity Photo.